Myers Briggs theory is very popular. Millions of people every year discover their personality type, using the Myers-Briggs Type Indicator® or one of a wide range of alternative questionnaires. Often the argument goes that, if you can discover your preferences, you can play to your strengths and develop your individuality. However, the creator of the theory (C.G. Jung) argued that knowing or using your preferences can lead you in one of two directions – one being cultured, the other barbaric. His view receives support from a perhaps surprising source – the Buddha. Although there are some differences between Myers Briggs and Jungian theory, they both consist of pairs of opposites, such as Extraversion vs Introversion, or Sensing vs iNtuition. In C.G. Jung’s version of the theory, some people (though not all) develop a natural tendency to use one of the opposites more than the other. For example, if you talk to extraverts then they will tend to respond immediately, but if you talk to introverts their first reaction may be to think about what you have said. Jung called this tendency ‘one-sidedness’, and Isabel Briggs Myers called them ‘preferences’. Knowing your preferences (or personality type) can be a good thing. Both Isabel Briggs Myers and C.G. Jung used personality type theory to help overcome conflict in relationships – e.g. by promoting mutual understanding. However (whether you know your personality type or not) exercising your preferences can also be a bad thing. In the book Psychological Types, Jung wrote that “a conscious capacity for one-sidedness is a sign of the highest culture, but involuntary one-sidedness, i.e., the inability to be anything but one-sided, is a sign of barbarism” (Jung 1921, p. 207, original emphasis). That is, having preferences and using them is OK. But you also need to be flexible and, in some circumstances, use your non-preferences. If you become so attached to your preferences that you use them irrespective of the situation you are in, this can lead to problems. 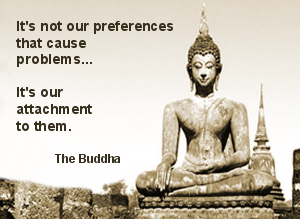 The Buddha summarised the issue in one of his sayings: “It is not our preferences that cause problems, but our attachment to them” (in Kornfield 1996, p. 35). ‘Barbarism’ is a strong word, but the way that one-sidedness manifests itself is often more subtle. It can be seen often in teamwork where, for example, someone might say ‘I am who I am, and other people have to accept me that way’. Invariably, this causes problems for the rest of the team as they have to work around that individual’s idiosyncrasies. In good teams, there is always a degree of give and take – using one’s natural strengths, but also being adaptable when the situation requires it. However, if any one team member is unable to adapt, it can be a significant handicap that limits the team’s performance. It can be worse if there are two team members who are inflexible, as this can lead to significant conflict or a schism in the team. Extraversion – speaks out to fill a silence, when would be more appropriate to listen. Introversion – doesn’t communicate information that is important to other people. Sensing – won’t try anything new, even when it would be better. iNtuition – changes things that already work well, i.e. can’t leave well alone. Thinking – rides roughshod over other people’s feelings, and can’t empathise. Feeling – avoids making tough but necessary decisions because they might upset someone. Judgment – won’t change plans and is inflexible. Perception – won’t stick to a plan and is unpredictable. For Jung, barbarism would be to go with one’s preferences, either being unaware of the needs of the situation or ignoring them. Culture, however, is having the ability to use one’s non-preferences – i.e. consciously choosing to use one opposite or the other when it is appropriate to do so. This entry was posted in Personal Development and tagged Jung, Myers Briggs, Type Differences on 7 October, 2013 by Steve Myers.